A medium length circular walk exploring the wooded hills and valleys surrounding Lee. One of Lee’s most attractive features is its situation among a honeycomb of thickly wooded hills and valleys. Formerly an integral part of the rural community these are still linked by a network of footpaths which can be explored within a couple of hours by the more adventurous visitor. Most of Devon was once covered by broadleaved woodland, which is a complex ecological system providing a habitat for a vast array of plants and animals. It also furnished fuel and timber, nuts and berries for human and animal consumption, shelter for homestead and livestock, charcoal, bark for leather tanning, plants for dyeing and medicinal use, game for food and sport–and so was a vital community resource. With the advent of cheap coal and improved transport and the development of alternative materials, woodland management declined. Broadleaved timber was often replaced by faster growing softwoods. 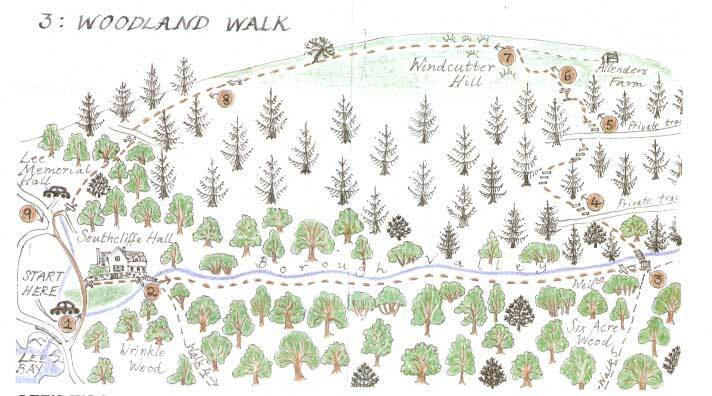 This walk gives access to two distinct types of woodland–the ancient broadleaved woods of the Borough Valley and the much more recent conifer plantations of Windcutter Hill, together with all the varied fauna and flora that they support. In addition, from the highest point at more than 500 ft above sea level, there are splendid views over downs and farmland to the east and the Bristol Channel to the north. While the path is clearly marked and can be walked in little more than an hour by the more energetic, it does have both steep and muddy stretches, so suitable footwear is essential. 1. From the car park near the sea front, take the footpath which runs inland (away from the cove). Follow it to the far end of the meadow where there is a stile on the right. Cross the meadow, below the wall of Southcliffe Hall, to another stile leading into Borough Woods. 2. Cross the footbridge over the stream and take the left-hand (lower) path. 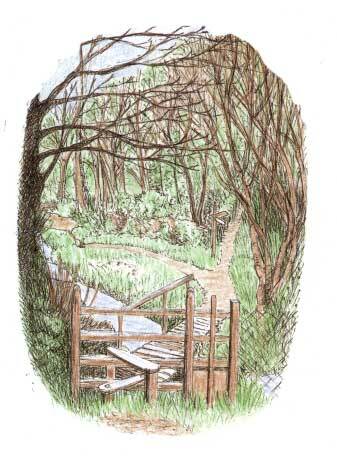 Follow this through woods alongside the stream for about a mile until you come to a well and then a stile. 3. Turn left following the yellow waymarker arrow through a small gate and over the footbridge across the stream. Carry on uphill through the conifer plantation. 4. Cross straight over the broad track and follow the steps up through the forest. The path winds steeply uphill until another track is reached. 5. Just across the track to the right is another yellow waymarker arrow; follow this path up through the conifers, crossing a small stream and then a stile to emerge into a field. 6. Carry straight on uphill making for the bank on the left-hand side of the gateway. Keep the hummocky gorse-covered area to your left and the thorn hedge to your right and pass into a narrow opening marked with an arrow. Continue straight ahead alongside the edge of the field, crossing an area of marsh and gorse, until you come to a gate on the right and then a stile, leading from Allender’s Farm. 7. Pass into the field ahead and turn left, following the direction of the telegraph wires and keeping as close to the hedge as the marshy ground permits. Carry on downhill through several fields until you reach the stile leading back into the forest. 8. Follow the path down through the conifer plantation until the broad track is reached. A few yards to the left on the opposite side is a stile. Cross this and carry on downhill until another stile leads out onto a lane just behind the Lee Memorial Hall. 9. Turn left opposite the church and walk back down through the village. At the Old Post Office take either the footpath or the road, both of which lead back to the cove and car park. Can you identify the following species of trees? A glossy-leaved evergreen popular for Christmas and carvings. A native broadleaved species used for ladder-rungs and barrel staves. Another which was used for spade handles and hockey sticks. One which was made into coffins and floorboards. A bush used for fences, sheep hurdles and thatching spars. And can you spot the following features? The ancient Borough Valley woodlands have survived throughout the centuries because the steep-sided rocky slopes on which they grow were impossible to clear for agricultural purposes. But during the two world wars wood was in great demand and large numbers of trees, especially oaks, were felled. Even so some remain as do other indigenous species such as ash and hazel. Elms have largely disappeared because of Dutch Elm disease. Species such as beech and sweet chestnut have been introduced and many have reached a splendid maturity while less desirable “invaders” like sycamore and rhododendron thrive. Woodlands as a Community Resource. An old route from Lee to Mortehoe. An alternative route to Mortehoe ran through the Borough Valley and had the advantage of being both more sheltered and less steep than the coast road. In the 1890s the owner of what was then “The New Inn” (the building which was until recently Lee Post Office) is said to have used this route to fetch barrels of beer by horse and cart. One well is still clearly visible just before the stile at the far end of the Borough Valley footpath. Its existence would point to the fact that this part of the valley was in frequent use. The 1904 map shows another close by it and even earlier maps show two more wells nearer the village on the opposite side of the stream. 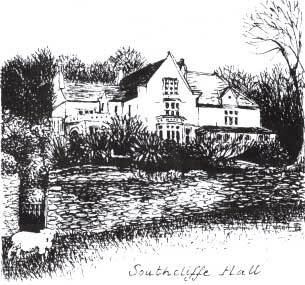 The original school at Lee stood close to the stream at the bottom of Wrinkle Wood a short distance from the entrance to Borough Valley. It was replaced in 1860 by the schoolroom next to the church (now The Old Schoolroom Craft Shop). Little more than one wall remains of the original building, hidden behind trees, as most of the stone was used to build the Wrinkelwood bungalow by the cove. This hill which rises on the eastern side of Borough Valley to a height of over 50Oft was transformed in character in the early 1970s when it was planted with conifers by the Forestry Commission. The trees are all Sitka Spruce (taking their name from the original capital of Alaska in the days of Russian colonisation) and are suited to the climate of the south-west, being resistant to sea salt and able to grow erect in the face of the wildest westerly gales. Nevertheless, conifers support fewer and different species from the native broadleaved woodlands due to the density and darkness of their shade. The building dates from the 1740s and was bought in the 1860s by the Reverend George Tugwell, the first vicar of Lee. The estate included surrounding land, Lower Warcombe House (now the Grampus Inn) and the Old Maids Cottage. The Hall itself was enlarged and many fetes were held in the grounds. Reverend Tugwell was a keen naturalist, an expert on marine life and the author of guide books as well as publications on religious topics and the natural sciences. He knew many famous artists and authors, including George Eliot, who in 1856 visited Lee and thought it an enchanting place. Reverend Tugwell himself she describes as “a charming little zoological curate who is a delightful companion on expeditions”. Tugwell died at Southcliffe in 1910, aged 81. In 1928 the house opened as a hotel, a venture which proved unsuccessful. During the war it was rented by a school from Surrey. A fire in 1945 caused extensive damage and for some years it stood empty until it was eventually sold and part of it demolished.